Beyond New Kingdom ceramics – our first giraffe from SAV1 East? With the end of the town season and because the work in the cemetery has just started, I finally have the opportunity to go back to the substantial backlog of sherds waiting in the courtyard. Today I processed some of the mixed material coming from the debris above our 18th Dynasty walls and floors in SAV1 East. Apart from re-used sherds, there are frequently fragments of animal figurines within the pottery baskets (which are then transferred to the desk of Meg and Ken for registration). A considerable number of mould-made animal figurines, especially of horses and other quadrupeds came up from the mixed fillings of SAV 1 East from 2013-2015. With the finds from today, I think we can add another animal to the group of quadrupeds from Post-Pharaonic times. One very nice pottery fragment caught my attention: it is a Post-New Kingdom, most likely Christian sherd of a large closed vessel. On its interior, the fragment was incised – this was done after firing and because of its location on the inner side definitely for a secondary use when the vessel was already broken. The adorable sherd from SAV1 East with an incised zoomorphic motif. 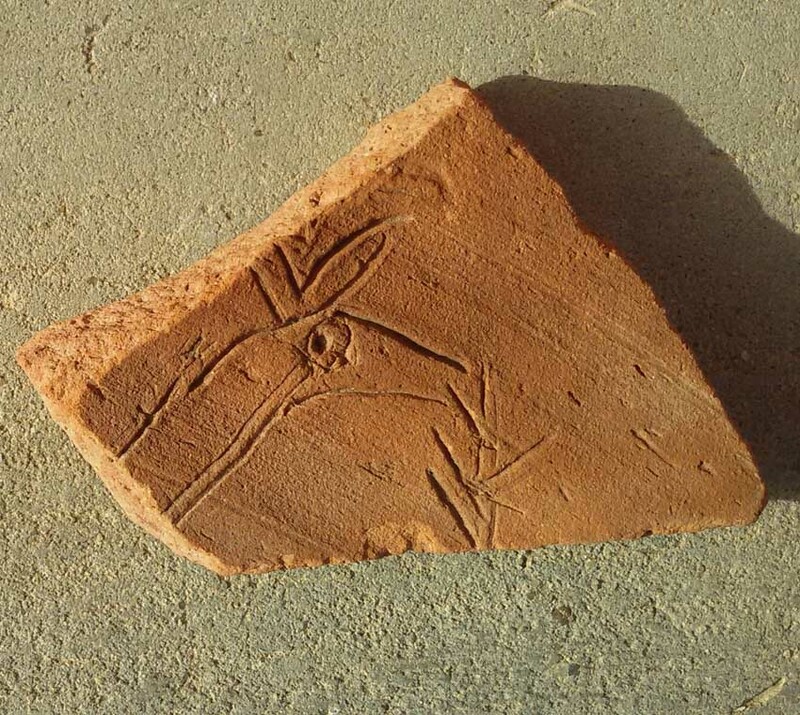 The motif of this “pot mark” is just adorable: the upper part of a giraffe eating from a tree is preserved. I was immediately reminded of the work undertaken by Cornelia Kleinitz on the graffiti at Mussawarat es Sufra – among her large corpus of pictorial graffiti there (dating to the Meroitic Period and later times) the “giraffe + tree” group is well attested (see http://musawwaratgraffiti.mpiwg-berlin.mpg.de/musalib?fn=permanent/Musawwarat/Graffiti/Website_Photos/Historical_Graffiti/Musawwarat2011-11-29_120553). The motif can also be found within rock art corpora, for example in the Fourth Cataract area. This entry was posted in Archaeology, Ceramics, Sai Island by Julia Budka. Bookmark the permalink.